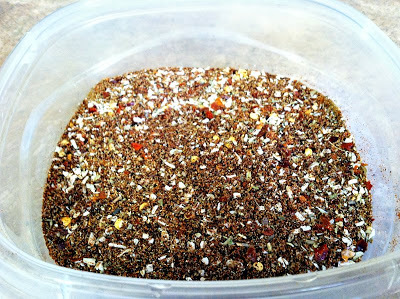 Homemade Taco Seasoning & a Lesson on What's in that Packet?! OK, I admit it, I used prepackaged seasonings and spices to simplify life but over the last few years I have stopped for the most part. Learning the right combinations for my favorite packets have not only decreased the sodium intake of my family but also the MSG not to mention the added benefit of it being MORE flavorful when used with my favorite recipes. The one packet I still used until recently was for tacos. Tacos used to be a weekly meal when the girls were younger and now we probably have them once a month. I wish I would have read the ingredients on the packages of these seasonings long ago. Maltodextrin, Salt, Chili Pepper, Onion Powder, Spice, Monosodium Glutamate, Corn Starch, Yellow Corn Flour, Partially Hydrogenated Soybean Oil, Silicon Dioxide (Anti-caking agent), Natural Flavor, Ethoxyquin (Preservative). First thing that stood out to me and made me laugh was, Spice. What?!?! Is this a big secret? Of course there’s that MSG but do you see the silcon dioxide? That’s sand, folks. Yep. Have you purchased a pair of shoes or handbag recently? Did you happen to notice the little white packets marked “Silica Gel! Do not eat! Throw Away!” ? That little packet is extremely harmful if consumed…actually fatal. This is what is in the packets…It’s used in a lot of things as a flow agent and partly because it does a nice job of absorbing a little bit of humidity that would cause clumping in a variety of things. Now – I am definitely not using the packaged seasonings/spices anymore. In fact, the ones I have in my pantry now are history, even though I haven’t had the urge to use them in quite some time. I realize that the FDA approves the use of ethoxyquin in regulated doses however, why do you want to ingest this or have your pets ingest it??? I totally understand that the use of ethoxyquin is used differently in foods than it is as a pesticide but still there is a concern. A couple of years ago I was diagnosed with high blood pressure and since then, I have been trying to rid my, and my family’s meals (that I prepare) of the high sodium and to make a conscious effort to eat healthier. It’s a struggle but in some ways it’s becoming easier. I have learned to shop the “outer perimeter” of the grocery store with ease and if my budget allows it, to buy organic meats and produce. Now that you know all of this, let’s get to the recipe for Homemade Taco Seasoning! Use it as you would the prepacked kind. About 3 tablespoons per 1 pound of ground beef (or turkey) and add 3/4 cup of water. About 3 Tbsp per 1lb ground beef (adding more or less, depending on your tastes) to the ¾ cup water, mix well. Pour over ground beef and mix. Simmer for about 15 – 20 minutes, stirring occasionally. Serve with your favorite taco shells and toppings. Note – Multiply the amounts to make a larger batch to have on hand for future uses. I love this because I don’t like buying packaged seasonings and more than I like buying a cake mix. You just don’t know what’s in them! I will definitely give this a go! Marcie, it seems like the packaged items are getting more and more like that…glad I have an alternative. Adjust the seasonings to your tastes too…spicier or milder.